Our extensively trained and experienced practitioners aim to optimise your health before, during and after treatment by offering a number of evidence-based complementary therapies. We have created a boutique healing space where you will receive genuinely personalised care. To practice Integrative Medicine, these fundamental values - and subsequent actions - inform everything we do. We take the time to really listen and understand that sometimes everything is too much. We are here to provide informative education about your cancer and be a sounding board about your evidence-based treatment options. We can advocate on your behalf with other practitioners, and fill in your knowledge gaps so that you can navigate the complex "Oncology World". We look for challenges and provide a comprehensive and workable plan that provides a degree of control and comfort over your cancer treatments. 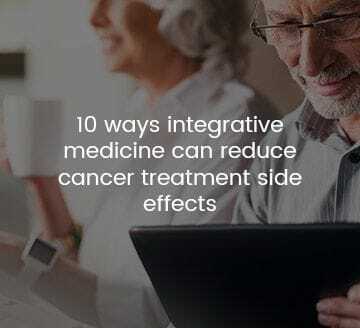 It is our determination and dedication to this field that ensures we have an extensive understanding of the medical and integrative approaches to best practice in the treatment of cancer. We strive to give you the confidence to know you have choices in the support of your well-being. There is no "one size fits all" support plan in Oncology. Our service is tailored to your needs. It is individual and unique. We are in partnership with you, your Medical Oncologist and other practitioners as your team that provides cohesiveness and transparency. We empathise with the difficult journey of a patient with cancer and their family members and loved ones. We want to put you at ease that even though your world has been turned upside down; we are here for you with realistic advice about your treatment options.